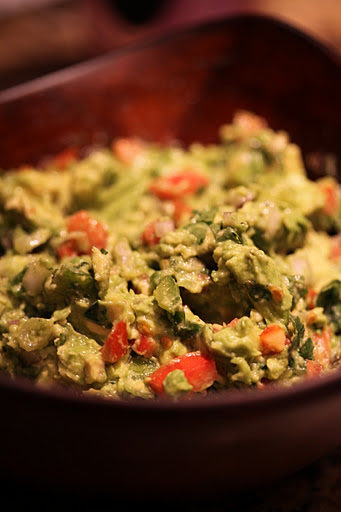 One of my favorite things to prepare fresh and homemade is guacamole, and holy crap is it good. And not only that, but it’s super easy and takes very little effort or time. Why would you ever purchase guacamole at the market again? First step is to cut and scoop out some avocado into a bowl. Then add in the rest of your vegetables. I like to just roughly chop up my ingredients and mix it all with a fork or spoon rather than using a processor or blender to make it smooth and, well, processed looking. A good rule of thumb if making an appetizer for four people is to use one small Roma tomato, 2-3 avocados, two stalks of green onions, and about an inch thick cut of red onion. 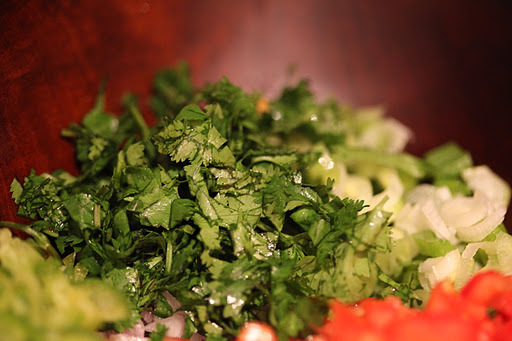 Chop up the onions, peppers, tomatoes, green onions, and cilantro, and toss it all into a bowl. Last step is to add garlic and seasonings and mix well, tasting and adjusting until you’re happy with it. In as long as it takes you to prep and mix all the items above, you’re done. This can take as little as 10 minutes, or a bit longer depending on how much you’re making. Squeeze a bit of lemon or lime over it before serving, and again squeeze some on it before storing it in an air-tight plastic container or under plastic wrap — but really, there won’t typically be leftovers, I promise. For adaptations to appease personal preferences, I’ve omitted the tomato for a friend who was allergic to tomatoes and it was still tasty — added a bit more lemon and spice for him. I’ve omitted the cilantro for friends who despise the taste and it’s not really missed by others enjoying the same batch. Green onions are added in when I have them on hand – simply because I like the texture contrast. Level of spiciness is up to you — add in jalapenos as much as you can handle, omit if you don’t need the spice. Total cooking time, 10 minutes to prep. Calories: approx 220 per serving. mmmmmmmm. btw, you are really good at food photography. ← Tender Pork Loin with Peppers and Green Beans.